Because of the new book, my schedule is packed this fall (come see me at an event near you!) and I'm not going to be home on election day! 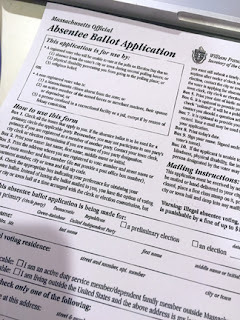 But I'm still going to try to do my civic duty and am applying for an absentee ballot! It's a pretty easy thing to do, so if you are going to be away from home on election day, you should do it, too!